Philadelphia Unemployment Project member Darryl Jackson addresses the UCubed Pre-event Rally on the day of the historic 10.2.10 One Nation Working Together March on Washington to call for jobs and justice for America’s working families. Thousands of labor, civil rights, religious and community activists from around the country joined Ur Union of Unemployed (UCubed) for the 10.2.10 Pre-event for the Jobless. 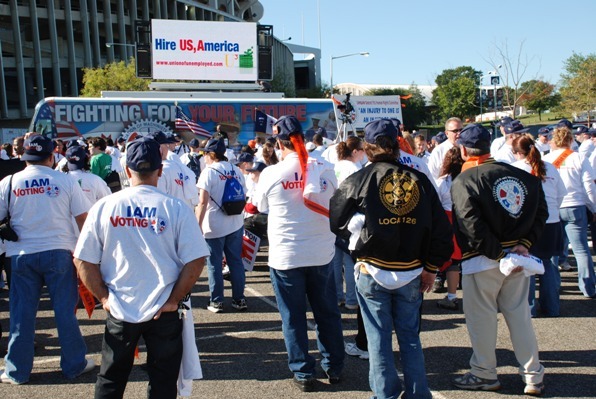 The Rally was held just hours before the One Nation Working Together March on Washington – a four-hour rally for jobs, justice, public education and getting out the vote on Tuesday, November 2, 2010. Pouring off buses, the activists stopped by the event to listen, pick up UCubed and IAM t-shirts, hats and signs, as well as to watch Bite Back, UCubed’s get-out-the-vote internet ad, playing on a huge video screen. The list of speakers included UCubed Jobs Activists Edrie Irvine and Elaine Murszewski, AFL-CIO Secretary-Treasurer Liz Shuler, AFSCME Secretary-Treasurer Lee Saunders, UNITE HERE President John Wilhelm, USAction President William McNary, Jobs with Justice Executive Director Sarita Gupta, NO LIMITS Vice President for Policy Leecia Eve and Philadelphia Unemployment Project member Darryl Jackson.